Unable to ‘empty’ your mind? Sore bum, needles and pins in your limbs? Haven’t got a designated dark room with soft music permeating and can’t quieten that incessant inner chatter? Despair not, look no further, for you are on the correct page. Up until my mid forties, I had lived with a self-diagnosed conviction that I suffered from an inability to meditate. That is until I came across Universal Medicine’s Gentle Breath Meditation™. How does one keep an ‘empty mind’? If we sit legs crossed in a lotus position in a dark and soundproof room long enough, can ‘emptying one’s mind’ truly happen? Is it something we ought to be even expecting? Advocating? Prescribing? Not long after I got to enjoy Universal Medicine’s Gentle Breath Meditation™, I introduced the very same powerful way of meditating to a lady ‘struck’ by the same ‘can’t meditate’ syndrome whose attempts to ‘successfully’ meditate (whatever that meant) and to be able to empty her mind of any chatter resulted in her entire family running for the hills at the sheer mention of the word meditation. She shared her story with laughter and light-heartedness a few years après abandoning all attempts to ‘productively’ meditate. The prospect of the family members walking on egg shells for the entire duration (which could have been anything up to an hour) of what she described as more of a tussle with meditation rather than actually mediating – and her family putting up with some (in their words) “weird”, new age music sounds coming out of the darkened room – was a tad too much to stomach, even when it came to their much loved mum and wife. A wall of aversion even to the notion of meditation was erected high on all sides. 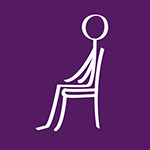 Looking at the etymology of the word – to contemplate, consider, ponder… through an act of calm, in other words, through connection to one’s body whilst keeping the mind in synch with the body instead of allowing it to pop off to all those close and far away places, plan next day’s lunch, prepare for next week’s meeting, think what should have been/could have been said in the last conversation etc etc, there is not even a suggestion in sight that any of what is today commonly acquired and accepted in truth applies to meditating. To suggest that by crossing our legs in a space designated to help us achieve a state of mind that is ‘empty’ would be like suggesting that when we turn a tap off there would be no water in the pipe. Impossible. Once we leave behind this adherence to long-term ideals and beliefs of what meditation ought to be and look like as opposed to what meditation truly is, meditation can begin to take on its true meaning as well as its practical ease of application. Which is to return to oneself. Not in any specially selected, confined or even open space, but anywhere and everywhere we may find ourselves: on a bus, train or plane, at school, work or hospital, café, conference and street… wherever our body may find itself in a moment. Realising that one does not need to travel to Kathmandu, Kerala or Kilimanjaro to meditate does wonders for the purse and brings meditation back to basics and its original roots – to stop and connect with All that lies deep within our innermost. It is revolutionary (to say the least) and amazing to know and feel that the infinite stillness we seek so deeply and so desperately is in fact already within. What true meditation enables us to do is to connect to this stillness and to its limitless soulful source. From that space and with the embodiment of this connection to our innermost we are then able to bring that stillness – an eternal, unadulterated part of our inherent make up – to everything that we touch, see, feel and say. With this union, meditation in action takes every interaction, communication and relationship to a whole higher level of living.